Today once again, I had out Paul Bednarz and his son PJ from Georgia. This makes Paul’s 6th trip with us so far. They did not mind that it was real hot today, because they were pretty busy catching fish and there was a very nice breeze. These two are always a blast and so funny to be with, especially when there catching fish…haha. A side note on todays trip, a lot of guide(s) are running around crazy simply because they can’t figure out the pattern, which is generally because they are just not experienced enough to know any different. You can always tell the professional guide because they obey the laws (like no wake zones), don’t get caught up in that situation trying to save a few dollars. It’s just never worth your time or money in the end. The fishing is not real easy this time of the year, it takes a experienced guide to find these fish day to day! r peacock bass. 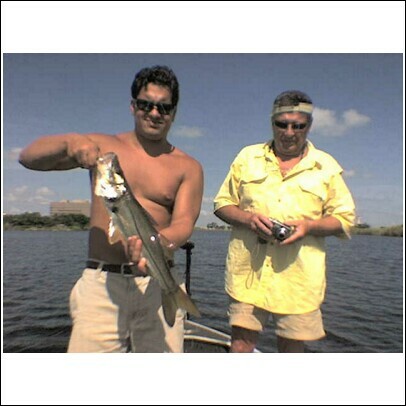 While we boated 30 plus fish, with several in the 4 and 5 pound range with even 3 snook added for icing on the cake. Don’t be fulled by a imposer, dressed like a fishing guide.